Actor-network theory (ANT), also known as the sociology of translation or sociology of associations, proposes a socio-technical account that makes no distinction in approach between the social, the natural and the technological (Callon, 1986; Latour, 1996, 2005; Law, 1992). ANT is based upon the principle of generalized symmetry employing a single conceptual framework when interpreting actors, human and non-human. Latour (1996) writes "an ’actor’ in ANT is a semiotic definition -an actant-, that is, something that acts or to which activity is granted by others. It implies no special motivation of human individual actors, nor of humans in general. An actant can literally be anything provided it is granted to be the source of an action" (p. 370). However, ANT has several limitations to be applied as a framework for dealing with complex learning environments. ANT explores the ways that heterogeneous networks of both human and non-human actors are constructed and maintained and focuses on tracing the transformation of these heterogeneous networks (Latour, 2005). Central to ANT is the concept of translation which is the process of creation of an actor-network and generation of ordering effects Law (1992). The main problem of ANT’s heavy emphasis on the construction, maintenance and transformation of actor-networks (i.e. translation) is that it reduces all actors into black-boxes, and thus ignores internal actions which are crucial for the creation of PKNs, and hence learning, such as seeing patterns, reflecting, (self-)criticizing, and detecting/correcting errors. These actions build the cornerstones of LaaN. Moreover, according to Callon (1986), the translation process consists of four major steps: problematisation, interessement, enrolment, and mobilisation. However, the creation of knowledge networks cannot be dictated by a predefined process. It rather requires self-ordering and self-organization. Law (1992), while exploring the strategies of translation, acknowledges the self-ordering nature of knowledge networks. As he puts it: "translation is contingent, local and variable" (p. 387). In contrast to ANT, in LaaN, the creation of knowledge networks is rather undetermined, often unpredictable internal process within the knowledge ecology which is, by definition, a self-controlled, self-maintained, and self-organized entity. Another limitation of ANT is that it does not distinguish between complex and complicated systems. ANT, particularly in Latour’s work, refuses to make the distinction between human and non-human actors i.e. between complex and complicated entities (Williams, 2007). ANT’s strong emphasis is on the heterogeneous nature of the actor-networks. Latour (2005) stresses that, in ANT, non-human actors, similar to human-actors, are treated as mediators rather than intermediaries. Latour makes a strong distinction between intermediaries and mediators. He writes: "For intermediaries , there is no mystery since inputs predict outputs fairly well: nothing will be present in the effect that has not been in the cause ... For mediators, the situation is different: causes do not allow effects to be deduced as they are simply offering occasions, circumstances, and precedents. As a result, lots of surprising, aliens may pop up in between" (pp. 58-59). Treating non-human actors as mediators makes from them complex entities where cause and effect are intertwined and cannot be separated. Non-human actors, however, are rather complicated entities - or in Latour’s terms intermediaries. All the components of a non-human actor are knowable and cause and effect relationships can be predicted. In LaaN non-human "actors" are just an enabler. At the heart of LaaN lie individual learners and their PKNs. • and, finally, about the type of studies done under the label of a science of the social as it is never clear in which precise sense social sciences can be said to be empirical. Latour argues that if the social is based on layers of uncertainties, then the social needs to be reassembled. However, in the new knowledge intensive era, the relationship between different knowledge nodes or in Law’s terms ‘heterogeneous bits and pieces’ is becoming flexible and is changing rapidly; thus, it cannot be captured through a reconfiguration process. Reconfiguration, or in Latour’s terms reassembling, works well for complicated systems in which different components and associated relationships can be identified and managed. Reconfiguration, however, cannot work while dealing with complex knowledge systems comprising many interacting identities. In the latter case, networking is the solution. In complex knowledge systems, the way the knowledge nodes network with each other results in unpredictable movements in the knowledge ecology. Knowledge ecologies lie at the heart of LaaN. Furthermore, Latour (2005) claims that "it’s possible to render social connections traceable by following the work done to stabilize the controversies" specified above (p. 16) and that the role of ANT is to trace actor-networks (p. 128). To note here that ’network’ in Latour’s vocabulary means something different. Latour points out that ’network’ is an ambiguous word meaning "a string of actions where each participant is treated as a full-blown mediator" (p. 128). To avoid this confusion, Latour suggests using ’work-net’ rather than ’network’. He writes: "Really, we should say ’work-net’ instead of ’network’. It’s the work, the movement, the flow, and the changes that should be stressed" (p. 143). In complex knowledge systems, however, there is no chance to trace social connections, nor is it possible to follow the actors or their actions. Latour himself acknowledges that following the actors themselves is not an easy task since, as he writes, "the actors to be followed swarm in all directions like a bee’s nest disturbed by a wayward child" (p. 121). Thus, there is no means to trace actors’ actions and connections because their actions are uncertain, unexpected, and often hidden; and their connections are varied, ubiquitous, and open. The role of LaaN is neither to follow actors nor to trace their actions or connections. Its major role is to help learners build and nurture their PKNs and to foster connections between different PKNs in order to form a complex, adaptive, dynamic, open, and living entity; i.e. a knowledge ecology. Callon, M. (1986). Some elements of a sociology of translation: Domestication of the scallops and the fishermen of st brieuc bay. In J. Law (Ed.) Power, Action and Belief. A New Sociology of Knowledge?, (pp. 196–233). London: Routledge & Kegan Paul. Latour, B. (1996). On actor-network theory: A few clarifications. Soziale Welt, 47(4), 367, 369–381. Latour, B. (2005). Reassembling the Social. An Introduction to Actor-Network- Theory. New York: Oxford University Press. Law, J. (1992). Notes on the theory of actor-network: Ordering, strategy and heterogeneity. Systems Practice, 5(4), 379– 393. Williams, R. (2007). Managing complex adaptive networks. In Proceedings of the 4th International Conference on Intellectual Capital, Knowledge Management & Organizational Learning, (pp. 441–452). New Role for the Learning Institution? In the new networked world, wouldn't it be better to think of the learning institution in a way similar to Amazon Marketplace. In that sense, the learning institution would step back from its traditional role of command and control and act as a hub connecting third parties providing personalized learning experiences to the learners? In this ebook, Terry Freedman provides a nice compilation of 87 classroom projects using Web 2.0 technologies. The projects listed in the ebook are quite interesting and almost all contributors stressed the benefits of using Web 2.0 technologies in their teaching activities. However, these projects - and all current Web 2.0-based classroom projects - share a common emphasis on how to best integrate the emergent Web 2.0 technologies into the learning process without influencing the traditional pedagogical principles and policies imposed by formal educational institutions. The result is that technology is often applied in the existing institutional context of learning controlled by the institution and organized into courses with preselected tools and predetermined learning outcomes. In my eyes, the challenge is not to mimic old ways of doing things with new technology, based on traditional institutional norms and values, but to first test, challenge, and eventually change the norms that govern our educational models before introducing new technologies. The problem of TEL is not a technology problem, but rather a cultural and pedagogical one. Another attempt by Harold Jarche to describe Personal Knowledge Management (PKM); This time as a Seek-Sense-Share process. Harold previously used other sequences to explain PKM as Sort-Categorize-Make Explicit-Retrieve; Connect-Contribute-Exchange; or Aggregate-Filter-Connect. For Harold "PKM consists of practical methods for making sense of the increasing digital information flows around us". In my eyes, this definition of PKM is simply (personal) information management under a new label. Information, however, represents only one side of the knowledge equation, namely explicit knowledge. In the KM literature, there is wide recognition that explicit knowledge represents only a small fraction of valuable knowledge and that there is a huge mass of high-quality knowledge embedded in people. This type of knowledge is what Michael Polanyi called tacit knowledge. Thus, I believe that PKM should involve a combination of explicit and tacit knowledge and that the major challenge is to properly address the tacit dimension of knowledge (i.e. people). I cannot understand why Harold still insists on describing PKM as a predetermined process such as seek-sense-share. The focus on PKM as a predetermined process conflicts with the complex nature of knowledge. Seek-sense-share represents only 3 processes that PKM can be in, and misses other crucial processes. This explains why Harold always comes up with a different sequence to explain PKM. Moreover, seek-sense-share is a clear view of PKM as a linear process. This linearity is not well adjusted to describing what is actually going on in PKM. In each new context, PKM is a unique process and is the result of personal and emergent processes that do not follow any particular order. A special report in "The Economist" on Germany's educational system. EC-TEL 2010 will bring together people researching, working on and working with technological developments, learning models, and implementations of new and innovative approaches to training and education. The conference will explore how the synergy of multiple disciplines, such as Computer Science, Education, Psychology, Cognitive Science, and Social Science, can provide new, more effective and more sustainable technology-enhanced learning solutions to learning problems. The conference welcomes researchers and developers from all countries and all industries to present their recent advancements from technologies, applications, and learning models in all areas of technology enhanced learning. In addition to the main program, EC-TEL 2010 will host workshops on topics related to the conference theme. Workshops promote scientific exchange amongst junior and senior researchers from different settings (i.e. universities, high-school, lifelong learning institutions, foundations, SMEs, companies, technology platforms). The workshops provide a face-to-face meeting point for exchange of information and experiences (i.e. project results, ongoing research, outstanding topics) related to Technology Enhanced Learning and the many sub-topics which embrace it. 4. Register at the EasyChair System. In this video, Tim Berners-Lee talks to the TED audience about Open Data and shows some results when the data can be mashed up. In a TEL context, this data can also be leveraged to build mashup personal learning environments. LaaN represents a vision of learning, where the line between Knowledge Management (KM) and Technology Enhanced Learning (TEL) disappears. In LaaN, work/learning is viewed from a knowledge worker/learner perspective, and KM and TEL are seen as being primarily concerned with a continuous creation of a personal knowledge network (PKN). This ensures that the differences between KM and TEL are converging around a knowledge worker/learner-centric work/learning environment and makes that the roles of KM and TEL are blurring into one, namely supporting the knowledge worker/learner in continuously creating and optimizing their PKNs. In this sense, KM and TEL are not the two ends of a continuum but the two sides of the same coin. Moreover, LaaN enables the seamless integration of work and learning. The view of learning as the continuous creation of a PKN makes learning and work so intertwined that learning becomes work and work becomes learning. 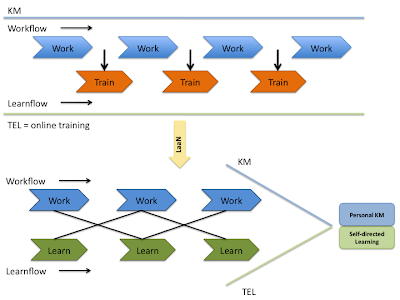 As illustrated in the figure above, TEL in LaaN is no longer regarded as an external online training activity separate from the work flow, but rather as a learner-controlled evolving activity embedded directly into work processes. Personalization: A LMS follows a one-size-fits-all approach to learning by offering a static system with predefined tools to a set of many learners around a course. A PLE, by contrast, is responsive and provides a personalized experience of learning. It considers the needs and preferences of the learner and places her at the center by providing her with a plethora of different tools and handing over control to her to select and use the tools the way she deems fit. Informal learning and lifelong learning support: A LMS is not supportive of informal or lifelong learning. It can only be used in a formal learning setting, managed and controlled by the educational institution. And, in a LMS, learning has an end. It stops when a course terminates. A PLE, however, can connect formal, informal, and lifelong learning opportunities within a context that is centered upon the learner. A PLE allows the learner to capture her informal and lifelong learning accomplishment and develop her own e-portfolio. In a PLE learning is fluid. It continues after the end of a particular course. Openness and decentralization: Unlike a LMS, which stores information on a centralized basis within a closed and bounded environment, a PLE goes beyond the boundaries of the organization and operates in a more decentralized, loosely coupled, and open context. A PLE offers an opportunity to learners to make effective use of diverse distributed knowledge sources to enrich their learning experiences. Bottom-up approach: Within a LMS there is a clear distinction between the capabilities of learners and of teachers, resulting into a one-way flow of knowledge. 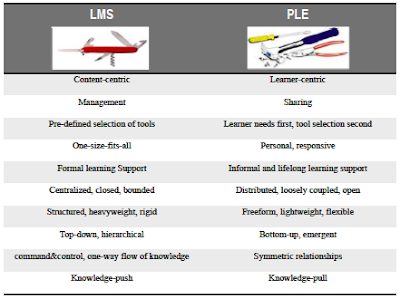 In contrast to a hierarchical top-down LMS, shaped by command-and-control and asymmetric relationships, a PLE provides an emergent bottom-up solution, driven by the learner needs and based on sharing rather than controlling. Knowledge-pull: A LMS adopts a knowledge-push model and is concerned with exposing learners to content and expecting that then learning will happen. A PLE, however, takes a knowledge-pull model. Learners can create their very own environments where they can pull knowledge that meets their particular needs from a wide array of high-value knowledge sources. Ecological learning: A PLE-driven approach to learning is based on personal environments, loosely connected. A PLE is not only a personal space, which belongs to and is controlled by the learner, but is also a social landscape that offers means to connect with other personal spaces in order to leverage knowledge within open and emergent knowledge ecologies. Rather than belonging to hierarchical and organization-controlled groups, each learner has her own personal environment and network. Based on their needs and interests, different learners come together for a learning experience. They work together until the learning goal is achieved and thereby do not have a permanent relationship with a formal organization or institution. The distributed PLEs can be loosely connected to build a knowledge ecology. Unlike LMS- driven groups/communities, which are closed, bounded, structured, hierarchical, and organization-controlled, a PLE-driven knowledge ecology is open, distributed, diverse, emergent, self-organized, and learner-controlled.